Earlier this year I received a journaling Bible and I have really been enjoying exploring my creative side and mixing that with time spent in my Bible. There are so many different fun Bible journaling supplies. One of my all time favorite supplies that I come back to nearly every single time is washi tape. Every month, I receive more supplies as part of my partnership with Dayspring that come in the Illustrated Faith devotional kits, including a new roll of washi tape every month. Today, I'm showing you how to use washi tape in your Bible. I think you are going to love it. Last month, I showed you how I used a devotional to supplement my Bible journaling. I used washi tape to create these mountains on this page that I made. 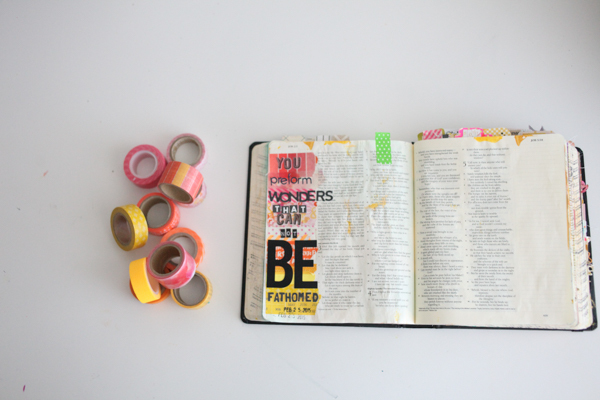 You can use washi tape in the margin of your Bible as a colorful foundation for your text. You can use letter stickers or your markers to draw on the top of the washi tape. I used washi tape to create a pocket to hold a bookmark on this page. You can also slip in other small cards or notes that you think might be helpful. I used these new washi stickers to create a border around the top of this page. You can also use washi tape to accent your page and to hold Bible tabs in place. I like these tabbies because then I can quickly find where I have been studying in my Bible. 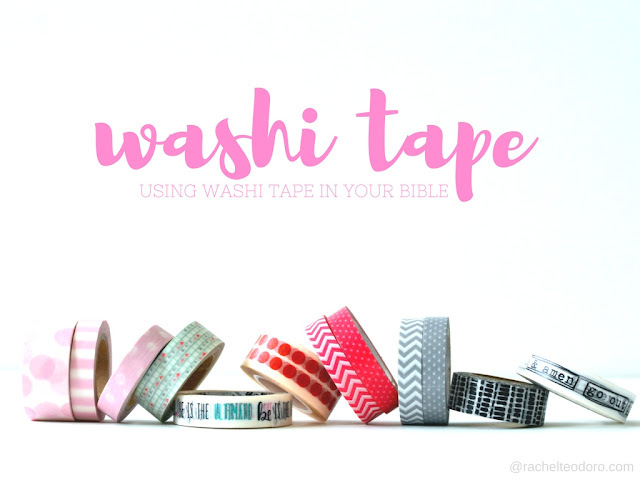 Today, I want to show you how you can use washi tape to on each book of the Bible. The only Bible I have ever had, had tabs in place to easily find each book of the Bible. After using this Bible exclusively for the past few months, I realized I missed that. I thought I would accent each book of the Bible with washi tape lining it. Not only did it make my Bible easier to use, it also made a really colorful side profile that I love. Start by tearing off a piece of your wax paper. You will use this between each page of your Bible. The washi tape won't stick to it and it will make it easier to apply and stick your washi. Lay down a piece of washi tape along the edge of your page. You will line up half of the tape on the page so that the other half will fold over to the back side. My Bible has rounded pages so I cut each end of the page and rounded it. This is the start of process and you can see what a difference it's making to make the edges that much more colorful. Continue on with each book until you make it to the end. That's it! I really love how this turned out and it made sitting down for two hours cutting tape totally worth it. It makes using my Bible that much easier and it gives the edge a fun colorful pop. Do you love washi tape? How do you incorporate it in your Bible journaling? 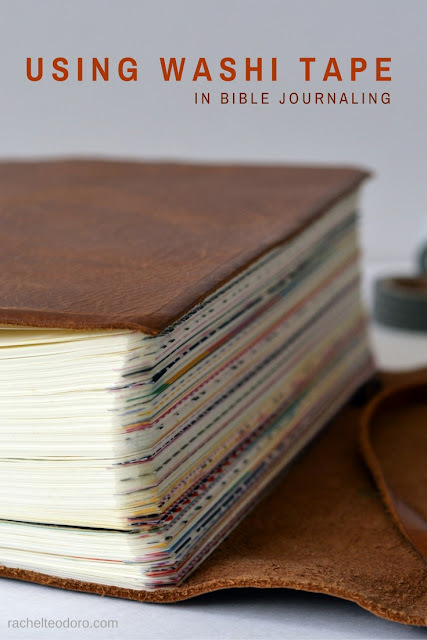 If you want to get started Bible journaling, start here for a beginner's guide. Love this post Rachel. Thanks for sharing. Does your bible have blank pages in it? How are you making a art spread on a whole page? (I love the washi tape idea btw). Betsy, my Bible has blank pages in it. There are a few different styles, some with wide blank margins, some with blank pages like mine. Sometimes the whole blank pages can be intimidating but I like the extra space. I love this! I would have to get a new Bible to try the washi tape on the chapter pages... but what a fun thing to do. I've had the same red Bible since forever... thin pages... I love the leather flap of yours, too. Thanks for the inspiration Rachel! Diane, my old Bible was something my mom and dad gave me more than two decades ago. I loved it and felt comfortable with it, it was even fun looking back on some of my high school thoughts and notes. I love this one and love having this new phase in my life documented in a different way. Where did you get your bible? I've been searching to find one that's right. I got my Bible from Dayspring. In the very first sentence of the post I link to it. You can follow that link and find the exact Bible I use. I love it! I love Washi tape and have kind of an embarrassing amount of it. I use it in my Bible on the pages i decorate similar to how you did for the books . Then i attach a tab with the address of the verse illustrated and a couple words from the verse to help me find it. Like yours it is colorful. Also, if the card stock tabs get worn they can be switched out without destroying the page. I use it a lot in my regular journal for color too. I use it on each book of the Bible. I think if it were on every page it would have taken me a zillion years! On every book, it took me around two hours to do it. I love it though. It makes it so easy to flip through and find what I need. How much washi tape did you end up using (length)? I want to be sure I have enough before I start. Hi Jenn! Since I used so many different kinds of washi tape, I never used a whole roll. I know that's not much help for you! I guess I would suggest getting about 8 different coordinating kinds. You probably won't use them all. If you don't, bonus, you have leftover washi tape! Nothing wrong with that! The pages in my Bible are not super thin Bible pages, but they aren't thick paper pages either. The washi tape is thin so it works well on them. Does the washi tape peel off the page without tearing the page itself? Hi Malena! I haven't really tried to peel back the washi tape from the edges, but when I have applied it to the page during my journaling, it peels back ok. I'm worried, though that if it's on the edge that it would indeed tear the page since it's such a thin area. Emily, I did not use 66 different kinds of washi tape. I only used about 10 different kinds and alternated the patterns. I didn't even use the whole roll of any of them, so it didn't use too much tape. I just liked having a variety of coordinating colors. Thanks Rachel! I didn't think you did, honestly, but I wasn't sure just how you did it. Got'cha! I can't wait to get started. God Bless! The wax paper just makes it easier to apply the washi tape. That way, the tape will line up and won't stick to the other thin pages of your Bible potentially ripping them.